March 15, 2019 -- Russia is at a crossroads in the organization of its imaging services, following the government's decision to make radiology more cost-effective via a five-year "road map" for the Moscow region. Tasked with the job of developing practice criteria and regulations for the program, the Research and Practice Center of Diagnostics and Telemedicine Technologies and the Moscow Society of Radiology have drafted a series of ambitious proposals to be validated and implemented by 2024. The objectives are threefold and are aimed at increasing availability, improving effectiveness, and enhancing skills through continuous education. 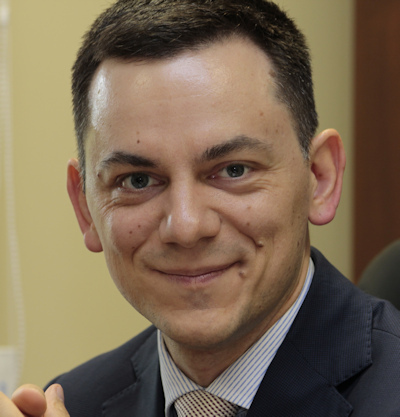 To improve cost-effectiveness, it is crucial that services reflect the evolving needs of the population, particularly in terms of breast and lung cancer screening, and the growing reliance on hybrid imaging, noted Prof. Sergey Morozov, PhD, CEO of the Research and Practice Center of Diagnostics and Telemedicine Technologies and chief radiology officer of Moscow. Courtesy of Prof. Sergey Morozov, PhD. Improving the economics and management of healthcare, particularly through IT, is a key focus, he explained. Statistics suggest that 20% of exams are unjustified. Plans include reducing unjustified exams through the use of IT programs. "Because exams are paid for by the state health insurance or privately by patients, justification of exams is not always considered," Morozov noted. "However, one of the government goals is to have a clinical support system checking exam justification, which hopefully would reduce costs." The collaboration between the society and the center is also striving to incorporate into radiology disciplines such as x-ray and ultrasound, which, to date, remain separate fields of expertise in Russia. In the greater city area, radiology is one of the largest specialties, with 17,500 staff members including specialists, technicians, and engineers across the region. Between 2018 and 2024, the Moscow population is estimated to reach almost 20 million. The current availability of PET/CT is 1.55 units per million inhabitants, compared with 1.1 units in Tokyo and 12.7 units in New York City. There were 19,000 PET/CT referrals in 2017; however, by 2024 these are expected to reach 75,000, reflecting 200% growth, he noted. Furthermore, only three years ago, PET/CT was not included in compulsory medical insurance but was paid for privately, Morozov continued. Now it is included in health insurance, and almost 19,000 patients benefited from insured PET/CT exams in 2018. This figure is expected to reach 30,000 in 2019. As a consequence, increasingly more radiologists are needed to perform PET/CT, and debate continues about whether or not nuclear medicine and radiology can be combined into a single hybrid imaging specialty. Now, the society is defining the professional standards for a two-year training course in imaging for nuclear medicine specialists, and the qualification is likely to be available this year. Morozov also highlighted how the country intends to upgrade its screening services, which are not of sufficient reach or quality at present, particularly for cancer, he said. 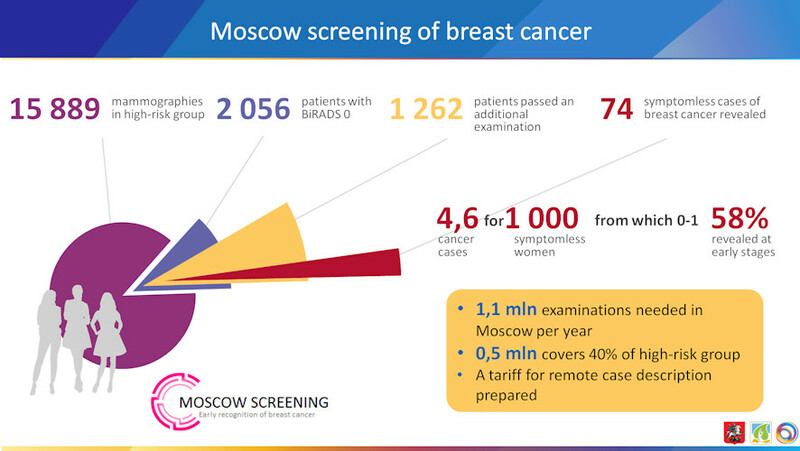 A pilot project for breast cancer screening that started in Moscow last year showed that of 15,889 mammograms in a high-risk group, screening revealed 74 symptomless cases of breast cancer. This worked out to be 4.6 cancer cases per 1,000 symptomless women, with 58% of the cancers being early-stage. A total of 1.1 million exams are needed to cover the high-risk group, Morozov noted. At present, 500,000 exams cover 40% of the high-risk group. Project results indicate that at least 80% of the high-risk group should be examined by 2024, but so far the Ministry of Health Service is proposing to reach a level of only 60%. Meanwhile, the road map's developers are trying to improve screening by training technicians and radiologists in BI-RADS and using artificial intelligence (AI) programs to help read screening data. For lung cancer screening, Moscow radiologists intend to harness the many CT units across the region. Studies have shown that screening detects 10% more stage I cancers than nonscreening, and it almost doubled overall early-stage detection (stages I and II), from 30% without screening to 58% with screening, Morozov noted. In Moscow, 57 symptomless cases of lung cancer were discovered from 9,000 low-dose CT exams across 10 polyclinics, for a cancer frequency of 1.76%, he added. "Ultimately, we need to screen 100,000 patients per year compared to the current 10,000 patients per year, meaning a tenfold increase," he said. "If we want to reach such a level, we have to take a number of steps: implementing campaigns and events to get people involved, improving patient logistics, and scaling up projects -- in 2019, all Moscow state outpatient hospitals will start lung screening." The road map's proposals are in part the result of a survey that the center conducted across different practices about what radiologists consider priority needs in terms of regulations, teaching, practice, and peer review. A total of 1,566 practitioners responded to the survey, conducted in May 2018. Among the key results, 61% of surveyed practitioners reported there had been unjustified exams in their institute. A total of 69% indicated there was a need for teleradiology because it provided value, while 25% said there wasn't a need for it, and 6% provided other opinions. Furthermore, 40% said they were prepared to pay for their own telemedicine education. For certain diseases such as breast and lung cancer, 86% said they would prefer targeted screening programs to general preventive medicine exams. Responses were mixed with regard to incorporating ultrasound into radiology, with 55% agreeing to it and 45% disagreeing on the grounds that it would be too impractical to incorporate it. From those polled, 57% believed that nuclear medicine should be incorporated into the specialty, 39% indicated they were firmly against it, and 5% provided other answers. The survey also revealed that 53% were in favor of creating a medical technician specialty; however, some of these respondents stated that it should not include ultrasound. Such a specialty would free up radiologists from performing lower-skilled tasks to focus on reading and reporting, according to Morozov. As a positive, he cited the result that 70% of respondents supported offsite reporting via teleradiology and generally accepted digitalization and e-health technology. "On a more negative note, there were some worrying results: 70% of respondents do not agree with extending residency from two to four years, 50% disagree with including ultrasound and x-ray in radiology, and 40% don't support incorporating nuclear medicine," he concluded. "A lot of Russian radiologists want to leave the specialty structure as it is. But our view is that this needs to change."